Both units use Dante® AoIP together with 4 wire connections so they bridge the gap between old and new technology, allowing the ease of connectivity & functionality of AoIP together with the legacy connections needed to operate with the existing infrastructure in some stadia and sports grounds. The AVN-CU2-DANTE provides two mic/line inputs with a wide, adjustable gain range and +48V phantom power, and has two stereo headphone outputs with lockable jack sockets, suitable for operation by two commentators. It’s powered using Power over Ethernet (PoE), using Neutrik EtherCON connectors, with primary and secondary ports for power and network data redundancy. SFP cages are also available for networking and there's an additional 4 pin XLR 12V DC input. 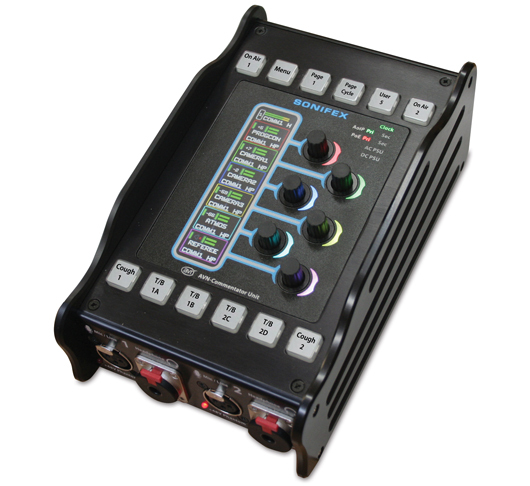 The unit supports up to 16 input and output AoIP channels and up to 16 simultaneous input and output AoIP streams. Stream setup to and from the unit is initially via Dante® Controller with more detailed configuration performed by using the built-in web GUI. A visual mix-matrix makes setup simple and intuitive and the CU2 can be remotely controlled from the web interface with front-panel lock-out options for unit operation. The AVN-CU4-DANTE is a dual version of the AVN-CU2-DANTE providing four mic/line inputs with a wide, adjustable gain range and four stereo headphone outputs with lockable jack sockets, suitable for operation by three or four commentators. The feature set is as per the AVN-CU2-DANTE, with the following differences – it has a universal AC input, there are 4 x on-air buttons, 4 x page buttons, 4 x cough buttons, 8 x talkback buttons and 3 x user buttons. The units will be available Q1/Q2 2019. For pricing, please contact sales@sonifex.co.uk or call +44 1933 650 700.